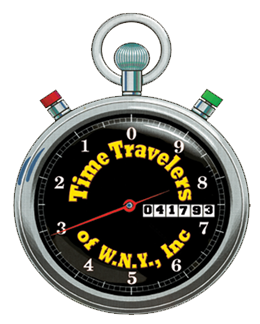 The Time Travelers of Western New York was established on April 17, 1993 as a family oriented organization surrounding our love of classic cars. Our mission continues to be focused around the promotion of a common interest in classic cars, the preservation of the classic car hobby, building friendships amongst car enthusiasts, and the participation in family oriented activities. However, the Time Travelers also has another mission, and that is to be an organization which not only serves to entertain itself through its events and activities, but to be an organization which serves the community as well. Over the years, the Olcott Beach Car Show has helped us to raise thousands of dollars which have been donated to local charities. Our current charity of record is the Ronald McDonald House of Buffalo. In addition to the annual cash gift that we give to the Ronald McDonald House, our partnership with it includes a classic car themed guest room which was decorated and is maintained by the Club, an annual sponsored food drive, a summer cook-out, gift cards from local businesses, and visits to the house with our classic cars for viewing by the guests. Our organization looks forward to continuing this collaboration with Ronald McDonald House for many years to come. The Club is involved in many cruise nights and car shows in the region. Whether it’s going to the CAZ show or the Hilton Apple Festival, or constructing a display for the Buffalo Motorama, the Time Travelers truly enjoy the classic car hobby. Over the years, the Olcott Beach Car Show has grown to over 1,000 cars. The 2014 show was featured on the TV series, “My Classic Car” with Dennis Gage. Our Olcott Beach Car Show has grown larger than the Time Travelers Club membership could manage. Therefore, the torch has been passed to Rod & Piston for future shows. Although under new leadership, the Show will be run the same as it has in past years. And, Time Travelers members will still be actively involved in the show.